Every custom ski pant and ski bib is equipped with durable oversized KEE #8 polyurethane waterproof zippers, keeping moisture out when you need it most. KEE waterproof zippers feature a tightly covered zipper track and a shiny polyurethane coating that creates a moisture tight seal. 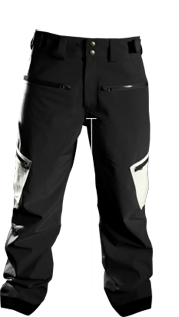 We also offer an additional option to add leg vents to your ski pants or ski bibs, a must have featuring while touring in the backcountry or skiing on warmer spring days. As skiers, we demand ski pants or ski bibs that fit well and keep us dry. Our ski pants and bibs feature a roomier, free ride type fit that is also super lightweight - just how you like it. Our ski pants and bibs are perfect for touring days in the backcountry, park laps with friends or ripping groomers in bounds. They are also designed to fit both men and woman. Acting as reinforcement where you need it most, cuff insteps feature a separate durable fabric (1000 Cordura) that is sewn directly on top of the face fabric. 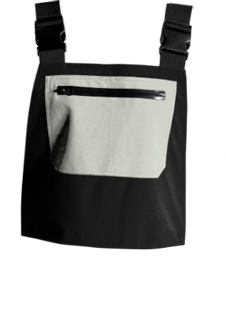 This creates an extra-resilient area to protect your ski pants and bibs from edge cuts and boot wear. Most ski pants and bibs wear quickly towards the boot cuff area - we designed our ski pants and bibs to help avoid cuts, tears in this area. We recommend measuring the entire circumference around the widest points of your hipbones. Measure from the bottom of your crotch down. Longer is usually better when wearing ski or snowboard boots. Measure from the top of your hipbone down. Longer is usually better when wearing ski or snowboard boots. Measure from roughly your belly button up to find your ideal bib length. IMPORTANT: The values in the chart below are the sizes of the pants themselves, so you should add an inch or two to your measurements when selecting a size. If your measurements exactly match a particular size, it's often best to go one size larger so that you have room to layer underneath and have adequate mobility.